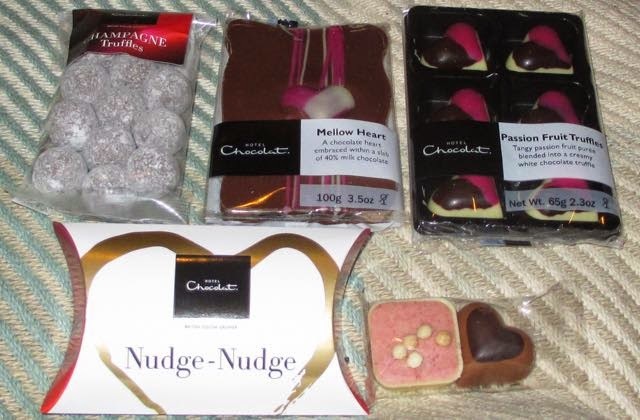 This lovely selection of goodies from Hotel Chocolat is reminder that it isn't long to Valentines Day! The lovely folks from Hotel Chocolat asked if I wanted to review their Valentines Goodie Bag, and how could I resist. The smart gift bag comes sealed with a ribbon and looks like it is packed with contents. I really enjoyed diving into all the goodies and seeing what was there. The first thing I noticed was the lovely bag of champagne truffles. The dusted milk chocolates have a thick milk chocolate case, and a silky smooth truffle inside with a nice twist of champagne. They taste very luxurious and the flavour balance is spot on. The champagne is strong enough to be noticed, but it works with the chocolate rather than against it. 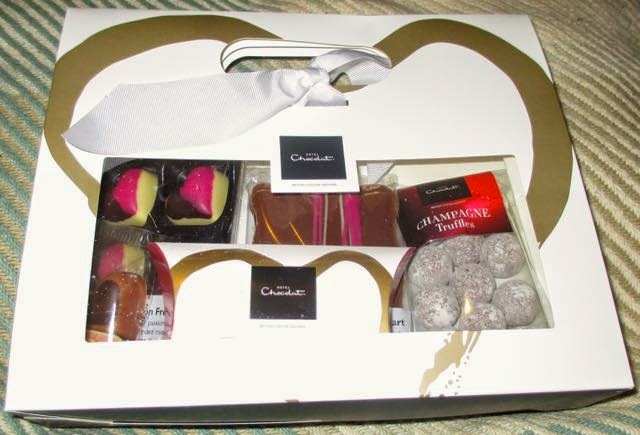 There was a duo of chocolates too, with an Eton Mess and a praline heart to bring some tastes of the selection boxes available. 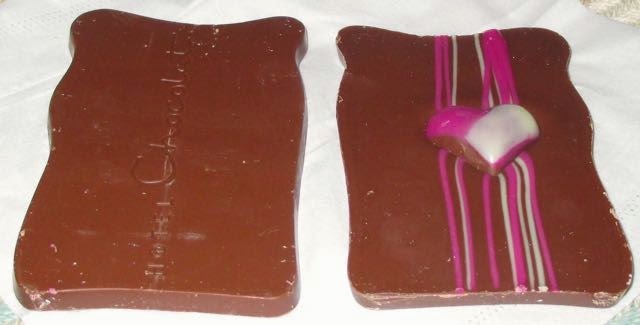 There are two milk chocolate bars in the bag, one of which is ornately decorated with a solid heart on the front, the other is undecorated, but just as nice. Hotel Chocolat milk chocolate is in a league of its own, it is one of the few chocolates where you can really pick up on impressive cocoa taste, and appreciate all its tones. It isn’t the creamiest milk chocolate but it is pleasantly sweet and moreishly smooth. 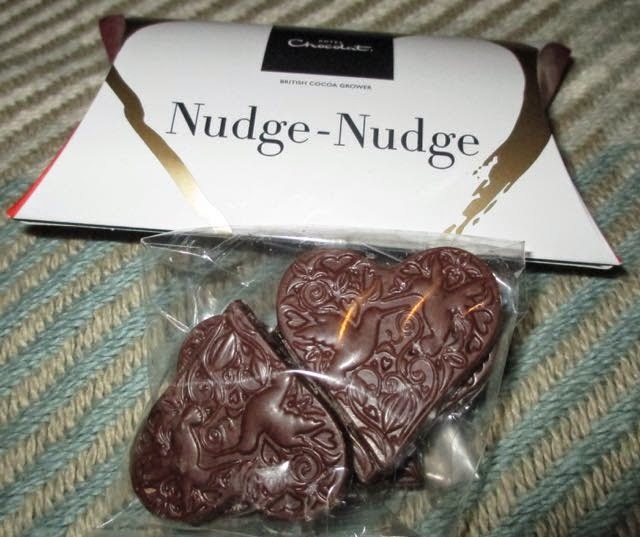 There are beautifully decorated milk chocolate hearts hidden the Nudge Nudge box too for good measure, each with doves and flowers embossed on them, so romantic. 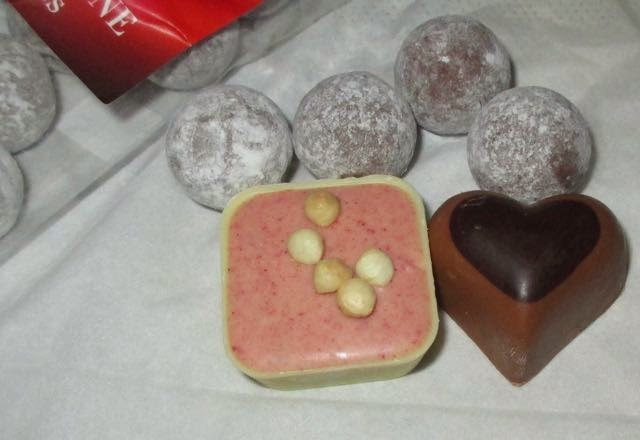 My favourite item in the box were the Passion Fruit Truffles. 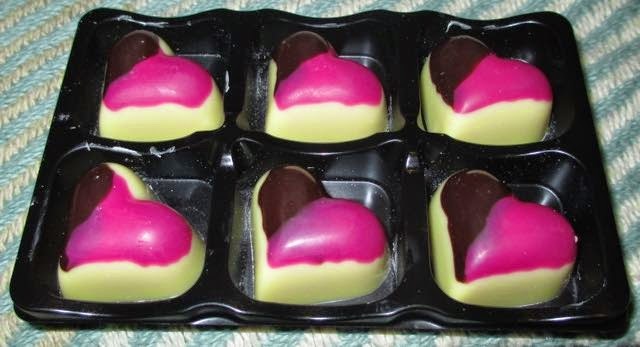 They are heart shaped and decorated with bright Valentine’s pink. I love fruit creams and these were so much more than that. The thick white chocolate shell was mellow and creamy and helped tone down the strong zingy passion fruit truffle inside. The combination was perfect the soothing chocolate bringing out the best of the sharp fruity taste.